Protesters demonstrate against the Energy Transfer Partners' Dakota Access pipeline near the Standing Rock Sioux reservation in Cannon Ball, North Dakota. Protests against the Dakota Access pipeline have been ongoing for weeks, but on Tuesday, rallies across the U.S. and world were held as part of a widespread “Day of Action” denouncing the project from a Dallas-based energy company. Hundreds gathered in front of the White House Tuesday afternoon in Washington to listen to speakers, including U.S. Sen. Bernie Sanders. In Dallas, about 50 people rallied in “peaceful solidarity” at the corner of Preston Road and Forest Lane Tuesday night to protest the four-state pipeline from Energy Transfer Partners, The Dallas Morning News reports. The company developing the $3.8-billion, 1,172-mile project to carry oil from North Dakota to Illinois says it is committed to the project. This, despite strong opposition and a federal order to halt construction near the Standing Rock Sioux reservation in North Dakota. They say the river is their main source of drinking water, and they are concerned about contamination. Kelcy Warren, CEO of Energy Transfer Partners, says in a memo to employees that the Dakota Access pipeline is nearly complete. 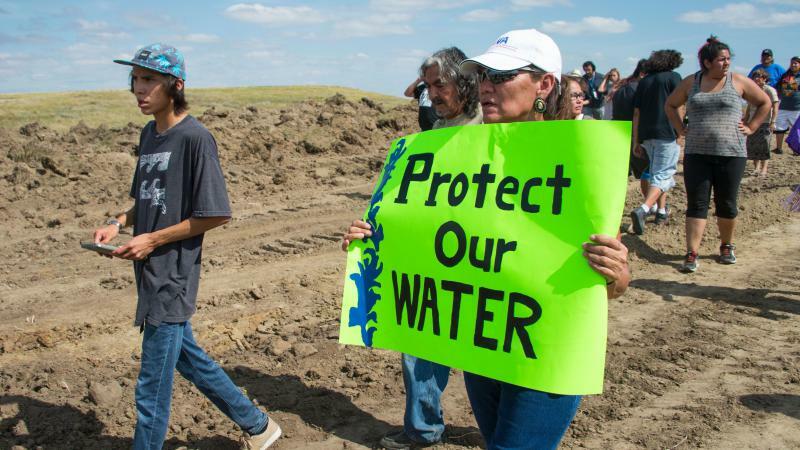 The Standing Rock Sioux tribe, which is suing federal regulators for approving the oil pipeline, says the project will cut through sacred sites and have a negative impact on drinking water. Warren says that "concerns about the pipeline's impact on the local water supply are unfounded." The Tuesday protest in Dallas comes two weeks after a similar protest in front of Energy Transfer Partners in Dallas. The same company is also behind the Trans-Pecos pipeline in Big Bend. On Friday, U.S. District Judge James Boasberg declined to block the pipeline, but the federal agencies stopped work on a small portion of the pipeline near Lake Oahe while they re-examine their approval of the pipeline on Army Corps of Engineers' land. They also asked Energy Transfer Partners to voluntarily stop work on a 40-mile stretch, though it isn't clear whether the company has complied. The Standing Rock Sioux Tribe was unsuccessful Monday in asking Boasberg to recognize three federal agencies' request to "voluntarily pause" work on the segment near Lake Oahe that the tribe says holds sacred sites and artifacts. The tribe said in court documents filed Monday that it wants Boasberg to "formalize" the agencies' requested stoppage for 20 miles on both sides of the Missouri River at Lake Oahe in southern North Dakota. The judge disagreed but did keep in place Friday’s order to halt construction on a small portion of the pipeline near the protest site near the Missouri River until a scheduled hearing Friday. Authorities arrested 22 people for interfering with the construction of the Dakota Access oil pipeline about 70 miles northwest of the main protest site, which is near the Standing Rock Sioux Reservation. North Dakota Gov. Jack Dalrymple has asked for federal help in coping with the long-running protest that has drawn thousands to land near the Standing Rock Sioux reservation. Dalrymple said Tuesday that he's asked White House officials as well as three federal agencies to help supply people and money "to maintain public safety." Dalrymple says that will mean indefinite delay in resolving the dispute. His office says the state and Morton County have spent a combined $1.1 million so far to police the protests. The Associated Press, The Dallas Morning News and NPR contributed to this report. The top local stories this afternoon from KERA News: Dozens of people gathered in front of Energy Transfer Partners in Dallas, to protest the company’s plans to build a controversial oil pipeline in North Dakota. Construction on the controversial Dakota Access Pipeline is allowed to proceed, except in one area in North Dakota of particular sensitivity to a Native American tribe. That's the result of two separate developments Friday — a federal court decision, and a statement by three federal agencies. A federal judge has granted part of a Native American tribe's emergency request to halt construction of a section of oil pipeline in North Dakota. A demonstration against the Dakota Access Pipeline in North Dakota turned violent on Saturday. On Friday afternoon, dozens of people gathered in front of Energy Transfer Partners in Dallas. 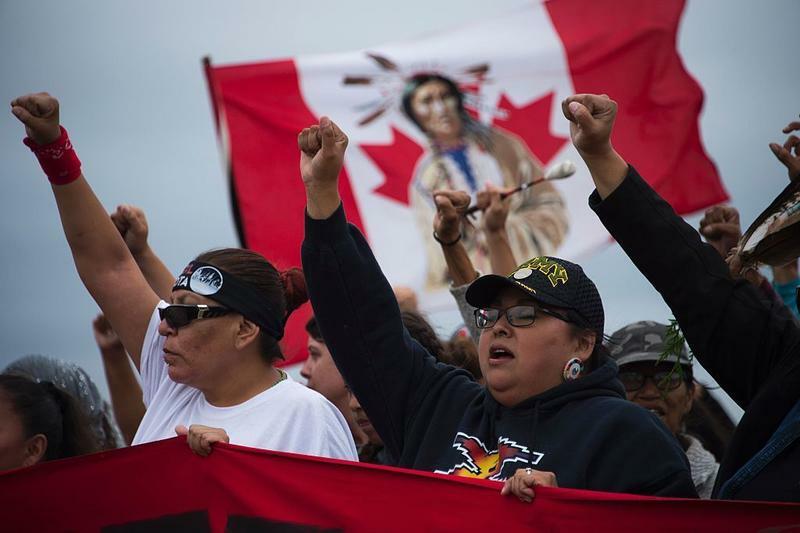 They protested the company’s plans to build a controversial oil pipeline in North Dakota. The same company is also behind the Trans-Pecos pipeline in Big Bend.